This recipe is my favorite. These three vegetables (brinjal, potato and drumstick) are the best combo. Deep fried in oil gives yummy taste. When it crackles add onion and saute a while. Add ginger-garlic paste and chopped tomatoes. Fry for 2 mins and add chopped vegetables. Mix well. Add turmeric powder, chilli powder, coriander powder and salt to taste. Cook it covered for 10-15mins. Fry it without adding water. Cook until oil separates. Serve hot with chappati or mix with steamed rice. We make drumstick aloo combo..nice adding brinjal too. I too make similar masala….tastes delicious…. 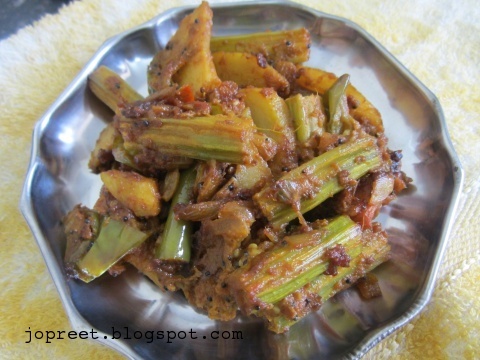 One of my fav sidedish for sambhar rice..